Our mission: To promote Republican values and support Republican candidates. 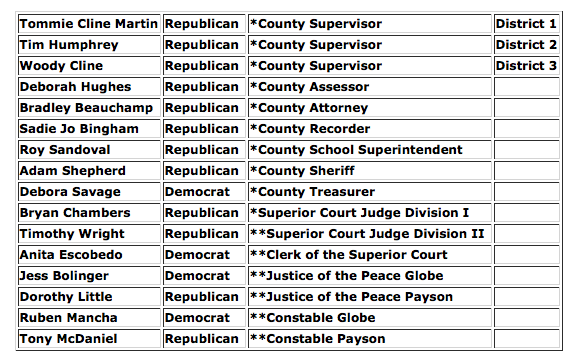 Explore our web site to learn more about the Gila County Republican Party. 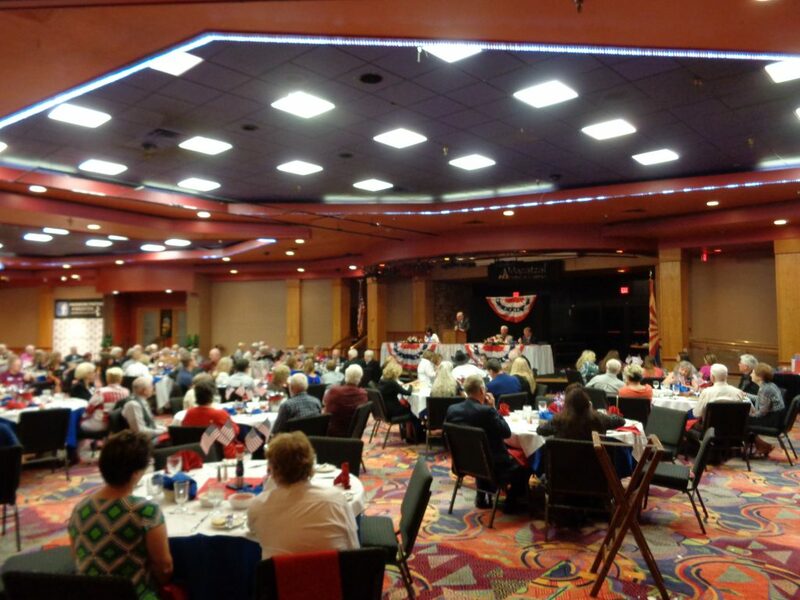 The Gila County Republican Committee had another successful Lincoln Day Dinner on March first with nearly 150 attendees at the Mazatzal Casino in Payson. Speakers were Congressman Dr. Paul Gosar, and from the state capitol, Speaker of the Arizona House of Representatives, Rusty Bowers. Also speaking was the newly appointed Executive Director for the Arizona Republican Party, Leslie White, who spoke about new directions for the Party. Little ole’ Gila County is getting a reputation of attracting top Republican leadership in Congress, as well as Arizona, to speak at our fund raising dinners. These dinners are really a nice date night out for couples in the elegant ballroom at the Mazatzal Casino. In addition to our guest speakers, a large number of elected officials from both the state and county also attend, thus allowing opportunities for attendees to meet these officials and talk to them about issues of concern. Another plus to those attending our dinners is that there is a question and answer period following each speech. Where else can you have an opportunity to ask a U.S. Congressman or a Senator a question, face-to-face? Our next fund raising event will be the Reagan Day Dinner on August 9, again at the Casino–save the date! 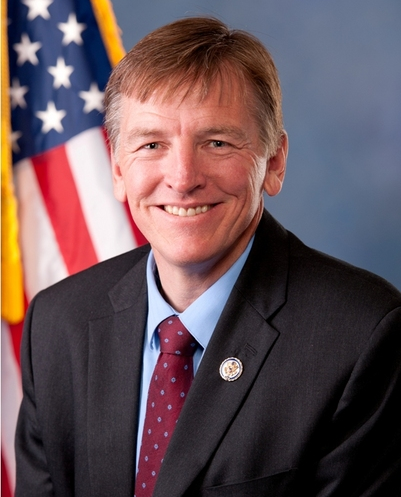 Currently booked is Congressman Dr. Paul Gosar, whose district covers the Payson region, along with the newly elected Arizona Republican Party chairwoman Dr. Kelli Ward. Dr. Ward has twice been a candidate for U.S. Senate. Presently, we also have extended an invitation to U.S. Senator Col. Martha McSally. The Gila County Republican Committee, at its August 18th Precinct Committeeman meeting, voted to oppose four of the state level propositions scheduled to be on the November ballot. The primary concern was that passage of any of the propositions would become part of the Arizona Constitution, and therefore could not be adjusted, altered, or ceased in any way without a hugely expensive financial burden on taxpayers to return the question to a vote of the public. The Committee was also concerned that the four initiatives are intentionally attempting to by-pass the legitimate legislative responsibility and the need for a thorough and open public debate on the initiatives pro’s and con’s. The Committee is further concerned that paid political ads in favor of passage will not constitute a fair and balanced “debate” and will be one sided with an agenda – particularly when the opposition cannot raise the funding necessary to counter the argument. It should also be noted that the initiative process is also foreign to the United States Constitution. The initiative process cannot be found anywhere in the Constitution, and for good reason. The Founding Fathers placed a heavy burden of deliberation on government, and the legislative process, to ensure a thorough and deliberate public debate occurs on matters affecting the Constitution along with a high mark of two thirds vote before the Constitution can be amended. The Reagan Day Dinner on Thursday, August 23, 2018 was another BIG SUCCESS! With a mission to make Arizona the best state in the country to live, work, do business and get an education, Governor Ducey and state leaders got to work. Today, Arizona’s budget is balanced. Business is thriving. And public schools continue to improve.The governor remains committed to what he has identified as his top priorities: growing the economy, creating and supporting 21st-century jobs, promoting educational excellence, protecting our communities and restoring fiscal responsibility – all without raising taxes on hardworking Arizonans. 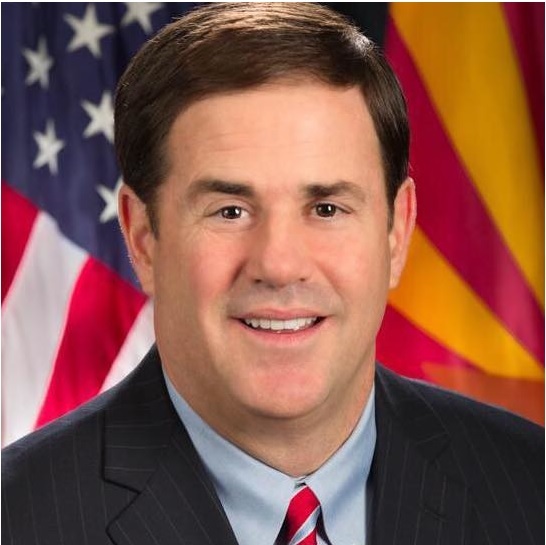 A strong Arizona is an Arizona that ensures “Opportunity For All.” Governor Ducey has pledged to work every day to make that vision a reality. Congressman Dr. Paul A. Gosar, D.D.S., is serving his fourth term in Congress as the Representative from Arizona’s Fourth Congressional District. First elected in 2010, he came to Congress with no prior political experience. Paul believes that the Constitution is the cornerstone of our Republic, and always pursues policies that allow for more individual liberty and less government involvement. Dr. Gosar is focused on bringing jobs back to the district, fighting illegal immigration and securing the border, challenging the status quo and holding Washington bureaucrats accountable, cutting wasteful government spending, and ensuring that he is representing the interests of his constituents. WHAT IS THE #WalkAway MOVEMENT? Giovanna Morfín Vázquez‎ to #WalkAway Campaign Hi everyone and happy 4th of July ! My name is Giovanna and I’m the daughter of two Mexican immigrants. My mother came here legally, but my father did not. However, he did not lallygag around and waste time. I remember when he was telling me that there would be a possibility of him being deported when Obama was president, but fortunately, he became a US citizen this year! But why did I #walkaway ? Effective June 4, 2018, the Gila County Republican Committee has opened its Payson headquarters located at 307 South Beeline Highway. The facility will be staffed by volunteers on weekdays from 9 AM to 5 PM. The public is welcomed to drop in for a visit anytime. The Committee has scheduled a public Grand Opening for the facility for Saturday, June 16th from 9 AM to 11 AM. Republican candidates for local, county, state and federal elected offices have been invited. Refreshments will be provided. This offers the public an opportunity to meet and talk to candidates about a variety of issues. The Grand Opening also offers an opportunity for any resident of Gila County can register to vote, or, the change a voter registration to the Republican party. 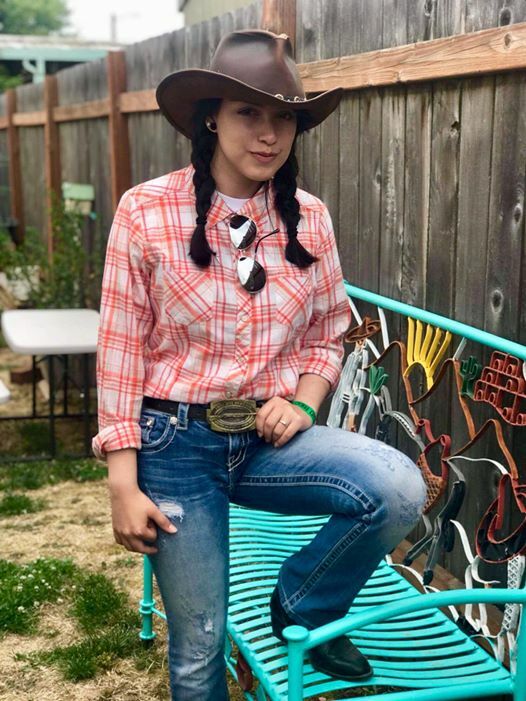 Also attending will be officers of the Rim Country Republican Club (Payson), the Cobre Valley Republican Club (Globe), and the Payson Tea Party which also offers the public to visit with this Republican leadership. Please look at the upcoming calendar events for GilaGOP. There are a lot of good events to attend in the upcoming months. You can click on the calendar at the bottom of this page. Just scroll down and click on it to view the events. We are always updating it with exciting events. The Payson Tea Party meets the every Tuesday night, from 6:00-7:45 pm, at Tiny’s Family Restaurant, 600 E. Hwy 260 in Payson. (That is about 1/4 mile east of the SR 87/Hwy 260 intersection on the north side of the street) We have a short business meeting before our speaker begins the program about 6:30pm. The Rim Country Republican Club meets at Tiny’s Family Restaurant, 600 E. Hwy 260 in Payson. (That is about 1/4 mile east of the SR 87/Hwy 260 intersection on the north side of the street) the last Monday of the month. Members and guests may gather at 11:00 AM to order lunch and to socialize. Beginning at 11:30 AM Everyone is welcome to attend. Call Cliff Potts at (928) 978-2960 for more information. Learn more about what is happening with the Gila County Republicans on the Monthly Meetings page or contact Shirley Dye at 928-951-6774. Why not to register as a Democrat??? See this video!